Adonato Leotelli is an Imperial bard and author, known for his books Olaf and the Dragon and Ghosts in the Storm. He is staying at Candlehearth Hall in Windhelm. 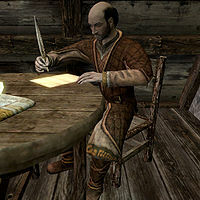 Adonato spends all of his time at Candlehearth Hall, socializing, eating, or sleeping at random intervals throughout the day, although he can always be found on the second floor between noon and 8pm, busy writing his next book. Adonato wears a set of fine clothes and a pair of fine boots. He carries an iron dagger to defend himself if threatened. He also carries a selection of common items and gold. When approached, Adonato will comment on recent events in Windhelm: "I still can't believe Isabella's gone. She was such a helpful young lass." He will then reveal he is an author, saying: "Know any tales of nobility and courage? I'm keen to record them. ", "I'll find some way to finish my book. ", and "Now more than ever, the world needs tales of heroism." He will exit conversation with: "May you lose yourself in the pages of a good book!" or "As you travel Skyrim, make sure you stop and take in the view from time to time!" When you speak to him, he will tell you: "I'm a writer by trade. Not that the people of Skyrim do much reading." Asking him what kind of writing he does will make him ask for a favor: "I write drama, friend. The legends and history of Skyrim made to excite and inspire. Poor Giruad Gemane [sic] at the Bards College has been waiting for my latest work, 'Olaf and the Dragon,' for weeks now. Roads are a mess." If you state that it's a shame, he'll agree: "Indeed it is." If you offer to help him, Adonato will quickly hand you the book and comment: "You're sure? When you see Giruad [sic], ask for a tip. I'm sure he'll be in a good mood after reading this." This page was last modified on 17 October 2018, at 23:46.